Fiddler and banjoist Adam Hurt comes to this music since the age of ten in his native Saint Paul, Minnesota. He has become a world-renowned player and teacher. Deemed a "banjo virtuoso" by the Washington Post, Adam has fused several traditional old-time idioms to create his own elegantly innovative clawhammer banjo style. In recent years, Adam has become a sought-after fiddler as well, playing captivating Southern and Midwestern tunes in a lyrical yet driving manner. He and Beth Williams Hartness have been performing duets of traditional music for the past ten years and are currently based in Danville, Virginia. Raised on a tobacco farm in Caswell County, North Carolina, Beth Williams Hartness began singing and taught herself to play the guitar when she was twelve years old, influenced by her mother's passion for early 1960s folk music. Initially playing with a flat pick, Beth eventually developed her own unique finger-picking style, reminiscent of that of Earl Scruggs and Maybelle Carter. Beth was a founding member of the Charlotte (N.C.) Folk Music Society, serving as vice-president and festival organizer. Her playing has been featured on various recordings of old-time music, including The Young Fogies II. Husband and wife team Pete Peterson and Kellie Allen hail from Oxford, Pennsylvania, where they are members of the illustrious Orpheus Supertones old-time string band and alumni of Waking Up Tillie. They also perform as a vocal duet and have recorded a debut CD entitled “I’ll Never Forsake You.” Enthusiastic supporters of old-time music, Pete and Kellie live in a 19th-century house in which they frequently host concerts, workshops. Kellie, originally from Kansas, is an accomplished old-time singer and sought-after bass player and backup guitarist. 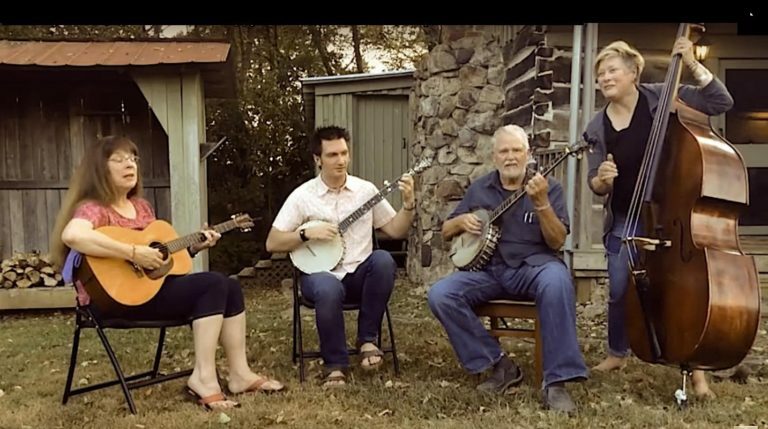 Kellie started playing old-time tunes with her brother, fiddler and banjo player, Greg Allen, while she was in her teens, and was inspired to sing and play by her musical family. She served a stint in Pay Attention, a 1980s indie rock band, and later toured Europe playing old-time music with the Delaware River Band. Kellie regularly teaches workshops and classes in guitar, bass, and singing. Pete, a long-time Pennsylvanian, got his first guitar and banjo over fifty years ago and now plays one of Charlie Poole's own banjos, recreating Poole's signature fingerstyle sound as closely as possible. Like his bandmate Beth, Pete plays guitar using a thumb pick, emulating the style of old-time guitarists such as Roy Harvey, Maybelle Carter, and Riley Puckett. In addition to performing, Pete is a popular and effective teacher of these banjo and guitar styles.